I always enjoy when Meryl Streep has a late August offering that somehow doesn't fit into the overall scheme that she is actively trying to be nominated for an Oscar every year. After Mama Mia, Julie & Julia and Hope Springs (of which the latter two I really enjoyed) I was hoping we might get another one soon as it's been three years since her last excursion into somewhat lighter territory. While she enjoyed a fair amount of success both critically and commercially with Into the Woods last award season it seems she is going in a completely different direction this year as far as movies concerned with music go. In her latest, titled Ricki and the Flash, Streep plays a musician who gave up everything for her dream of rock-and-roll stardom only to return home years later, looking to make things right with her family. The interesting aspect of this film is the combination of talent it has driving it. Not only does it have Streep as the star, but it has Diablio Cody (Juno, Young Adult) penning the screenplay and Jonathan Demme (Silence of the Lambs, Philadelphia) behind the camera. Demme hasn't really directed an out and out commercial feature like this since (maybe) 2008's Rachel Getting Married and so, even if this first trailer looks a little hokey and manipulative, I am interested in seeing what these three talents pull together. The other interesting aspect for me was that Streep's character and her band (the Flash) aren't singing original songs written for the film, but rather past hits by Bruce Springstein, Tom Petty and Lady Gaga among those also featured in the trailer. Will this be an alternate universe where those songs belong to Ricki or did she get famous by simply being a cover band? I guess we'll find out August 7th when Ricki and the Flash opens. The film also stars Kevin Kline, Rick Springfield and Streep's real-life daughter Mamie Gummer. 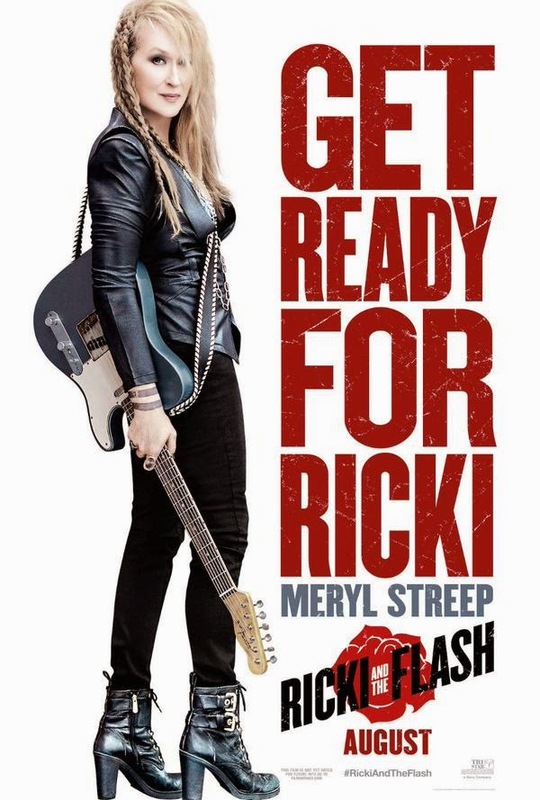 Synopsis: Three-time Academy Award® winner Meryl Streep goes electric and takes on a whole new gig – a hard-rocking singer/guitarist – for Oscar®-winning director Jonathan Demme and Academy Award®-winning screenwriter Diablo Cody in the uplifting comedy Ricki and the Flash. In a film loaded with music and live performance, Streep stars as Ricki, a guitar heroine who gave up everything for her dream of rock-and-roll stardom, but is now returning home to make things right with her family. Streep stars opposite her real-life daughter Mamie Gummer, who plays her fictional daughter; Rick Springfield, who takes on the role of a Flash member in love with Ricki; and Kevin Kline, who portrays Ricki’s long-suffering ex-husband.